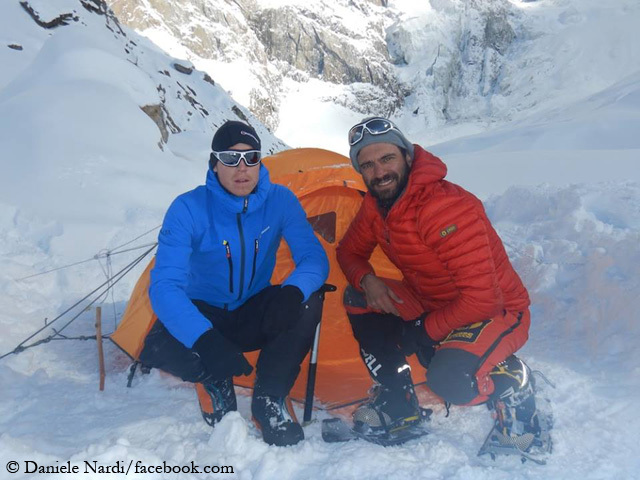 Military helicopters took off twice today on Nanga Parbat to search for the missing climbers Daniele Nardi and Tom Ballard. In vain. The 42-year-old Italian and the 30-year-old Briton had last reported on Sunday from an altitude of about 6,300 meters on the “Mummery Rib”, a striking rock spur in the Diamir Face that has never been climbed completely so far. 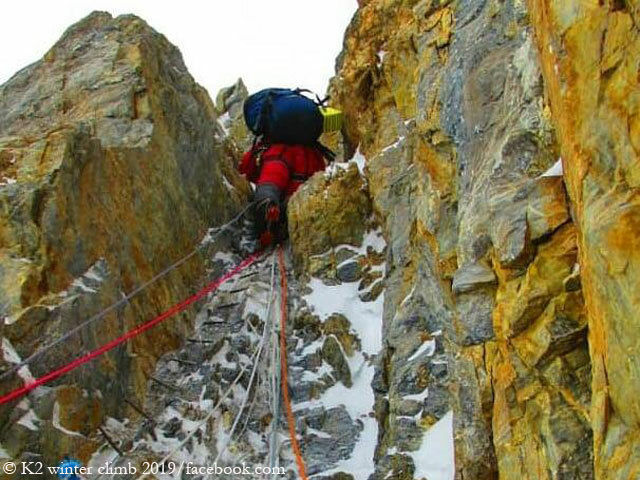 Since then, there has been no sign of life from the two climbers. Muhammad Ali Sadpara, one of the three winter first ascenders of Nanga Parbat in 2016, was flown by helicopter from Skardu to the base camp in the morning. The helicopters then flew up to 7,000 meters to search for Nardi and Ballard. Muhammad Ali reported that the pilots had discovered Nardi’s and Ballard’s camp site at 6,300 meters, buried under snow. According to the 43-year-old Pakistani mountaineer, traces of avalanches were visible in the area, showing how dangerous this zone was. That is not good news. 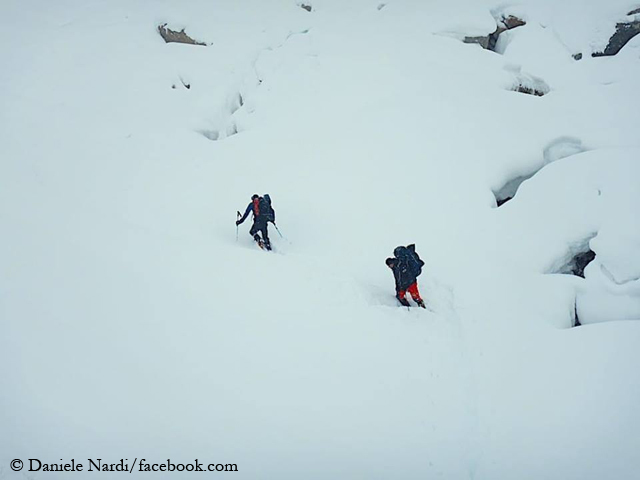 Search on Nanga Parbat for 🇮🇹 @NardiDaniele and 🇬🇧 Tom Ballard will resume tomorrow morning weather permitting. Pakistan Army pilots made some headway today. Very grateful for their total dedication. Tomorrow reinforced team should be at work. Let’s hope and pray for the best. According to Stefano Pontecorvo, Italy’s ambassador to Pakistan, the helicopters will take off again on Friday – if the weather permits. 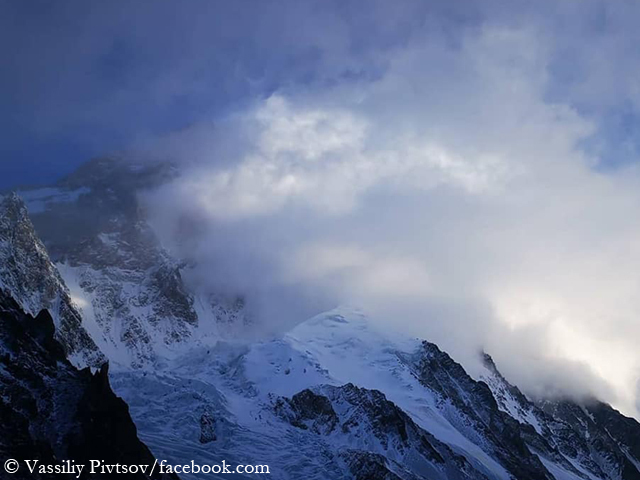 For the next few days, stronger wind and snowfall are expected on Nanga Parbat. This could further increase the risk of avalanches at the Mummery Rib. It is a race against time. 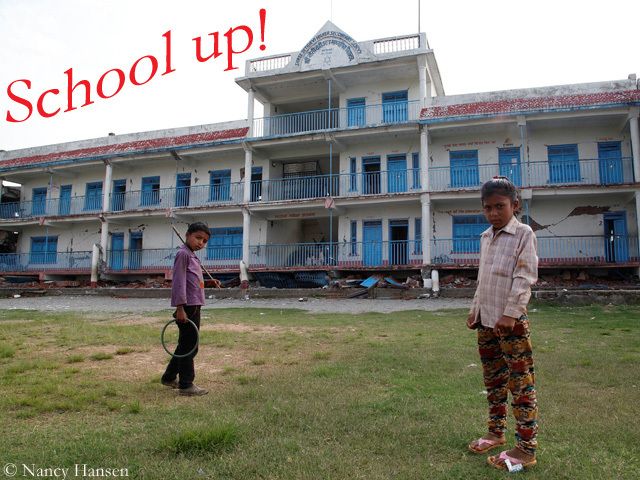 So keep your fingers crossed – or pray! With every hour that passes without any sign of life from Daniele Nardi and Tom Ballard, the concern for the two mountaineers grows. The last call of the 42-year-old Italian and the 30-year-old Briton by satellite phone from Nanga Parbat was received on Sunday from an altitude of about 6,300 meters – from the “Mummery Rib”, which they wanted to climb completely for the first time. Since then radio silence. This does not necessarily mean that something has happened to them. Maybe they are stuck in a radio hole. Or the battery of the satellite phone has run out. Nevertheless, an uneasy feeling is spreading. Actually, it goes without saying. 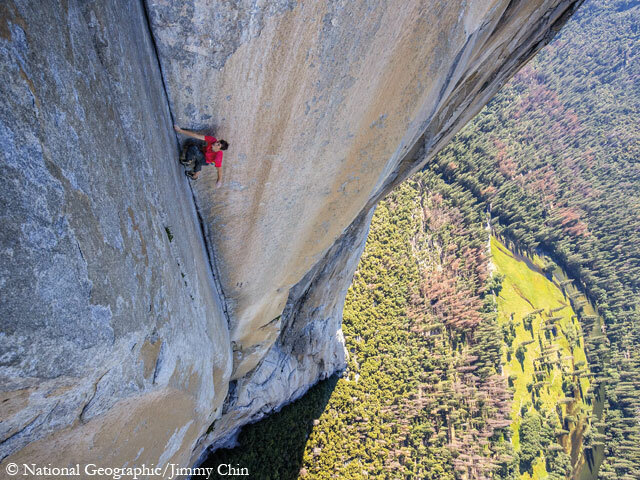 To recommend an Oscar-winning film is like telling a visitor of Yosemite National Park to take a look at El Capitan. But I have written the following movie review before “Free Solo” war honored as best documentary last night in Los Angeles. Honestly! Everybody’s afraid for Alex. His girlfriend Sanni, his friend and training partner Tommy Caldwell, the camera crew. “Alex has the best day of his life, I not,” says cameraman Mickey Schäfer and turns his back on his tool. “I’m done.” With a super telephoto, he films the ascent of American climber Alex Honnold on the legendary granite giant El Capitan via the “Free Rider” route. German Alexander Huber opened it in 1995, three years later he and his brother Thomas climbed the route redpoint: free and in one push. How long does the good weather last on Nanga Parbat and K2? Let’s go up! It’s as if someone had opened the gate of a pasture where a herd of bulls had been penned for almost two weeks. As soon as the weather improved on K2 and Nanga Parbat, the climbers of the winter expeditions made their way up. 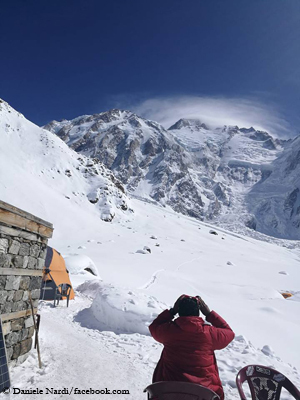 On the 8,125-meter-high Nanga Parbat, the Italian Daniele Nardi and the Brit Tom Ballard, according to their home team, today pitched up their tent at about 6,000 meters – after entering the “Mummery Rib”. They want to climb the striking rock spur completely for the first time and then make their way to the summit. “We are a bit tired because we had to carry heavy backpacks up to pitch up Camp 3,” Daniele let us know. Winter expeditions: After storm and snowfall, before the ascent? The “torture of climbers” is coming to an end. For almost two weeks, the members of the winter expeditions on the eight-thousanders K2 and Nanga Parbat in Pakistan were more or less condemned to do nothing because of the adverse weather conditions. Hardly anything is worse for mountaineers, who are always drawn outside and up. But strong wind and snowfall prevented ascents into high altitudes. 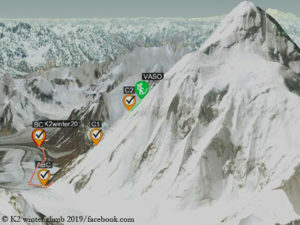 In K2 Base Camp, the team of Spanish expedition leader Alex Txikon built a 1.80 meter high and 20 centimeter wide ice wall in front of the tents to protect themselves against the expected hurricane gusts. A good idea. Wind speeds of more than 100 kilometres per hour were measured (see Alex’ video below) . “Spirits that I’ve cited, my commands ignore”, wrote Johann Wolfgang von Goethe in his ballad “Der Zauberlehrling” (The Sorcerer’s Apprentice) in 1797. 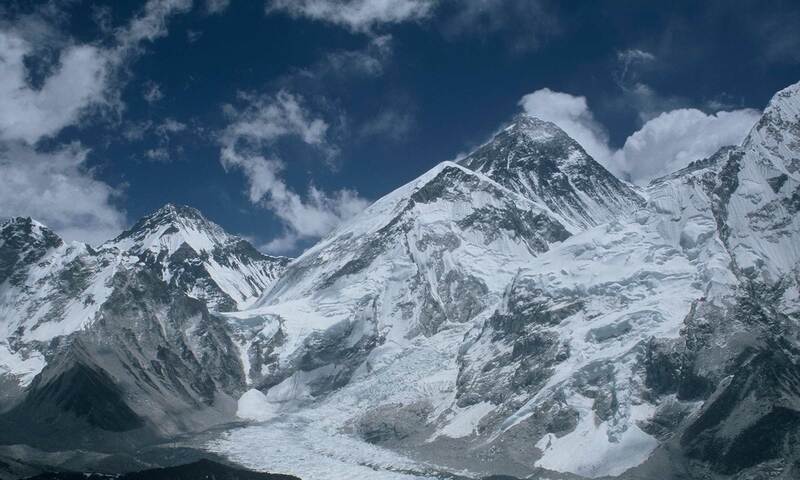 In German-speaking countries this became a dictum – which also describes quite well the current situation in the so-called “Chinese Base Camp” (CBC), at 5,200 meters, on the Tibetan north side of Mount Everest. Several tens of thousands of tourists have visited the camp year after year – and left a lot of rubbish behind. I don’t give a damn. According to this maxim many mountaineers seem to be en route on the highest mountains in the world. Instead of removing their fixed ropes, they leave them hanging, instead of taking their garbage with them, they leave it lying there. Vassily Pivtsov, leader of the K2 winter expedition from Kazakhstan, Russia and Kyrgyzstan, reported that he and his team mates had found a lot of used and full oxygen bottles below House’s Chimney, one of the key points of the route via the Southeast Ridge, as well as further rubbish like old tents. 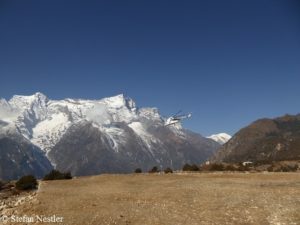 In the ongoing discussion about the large-scale insurance fraud caused by faked helicopter rescue flights in Nepal, one aspect is missing out in my opinion: As reprehensible as the illegal activities of the trekking agencies, guides and hospitals involved in the scandal are and must therefore be punished, the attitude of many trekking tourists and mountaineers who let themselves be flown out by helicopter also plays a role. The question must be allowed: How willingly has one or the other alleged patient gone on board? Flip sounds the alarm. “This is the climate crisis you haven’t heard of,” says Philippus, called “Flip” Wester. The Dutch scientist is a world-renowned expert on water resource management. 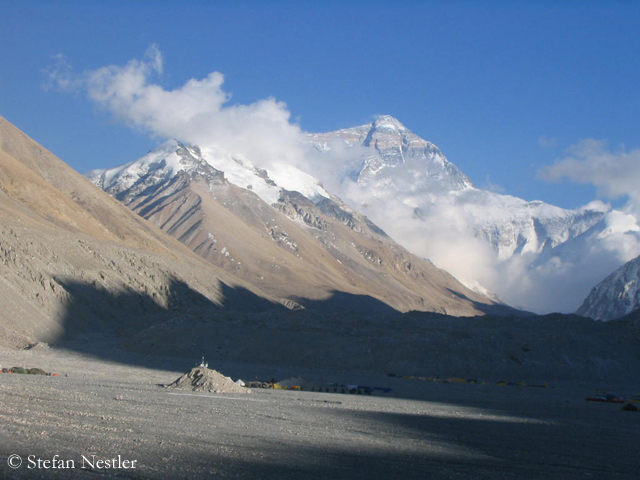 On behalf of the “International Centre for Integrated Mountain Development (ICIMOD)” in Kathmandu, Wester has led what is probably the most comprehensive study to date on the state of the Himalayan and Hindu Kush mountain regions. More than 350 scientists were involved. Their forecasts are alarming: Even if it were possible to meet the most ambitious goal of the Paris Agreement 2015 on climate change – to limit global temperature increases to 1.5 degrees Celsius above pre-industrial levels – one third of the glaciers in the Himalayas and Hindu Kush would melt by 2100. 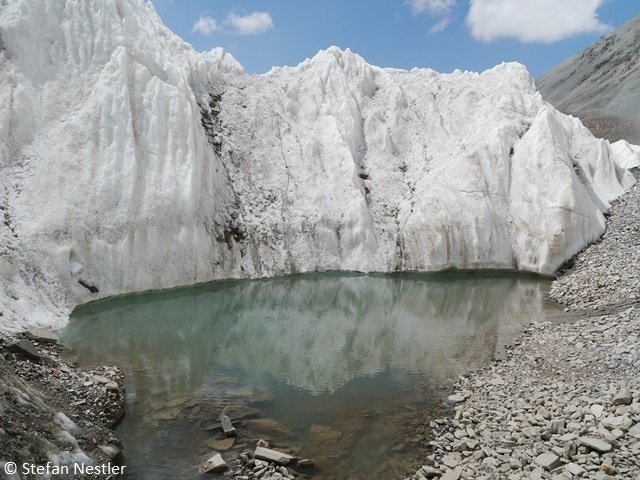 In the event that the climate protection policy fails, the study predicts a global temperature rise of five degrees, two-thirds of the glaciers on the world’s highest mountains region would then have disappeared by the end of the century. Winter expeditions to eight-thousanders are not a walk in the park. This winter proves that once again. 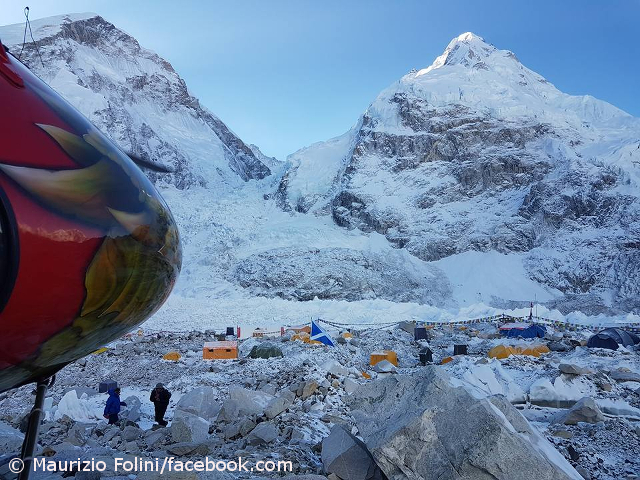 As reported, Manaslu in Nepal has already put the Italian Simone Moro and his Nepalese climbing partner Pemba Gyalje Sherpa to rout. 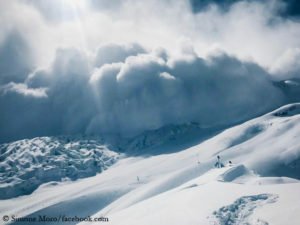 According to Simone, fresh snow in the base camp piled up to six meters. The danger of avalanches was correspondingly high. Time to disappear: “Sometimes giving up is an essential ingredient for future success,” Moro wrote on Facebook. “With this decision I want to honor the nickname ‘winter maestro’ I have been given.” Having scaled Shishapangma, Makalu, Gasherbrum II and Nanga Parbat in the cold season, the 51-year-old had succeeded first winter ascents on four of the 14 eight-thousanders. Today is the eighth anniversary of Simone’s success on G II in the Karakoram.